CCleaner, one of the most downloaded Windows cleaning and optimization utility, has been updated to add support for the recently released Windows 10 operating system. 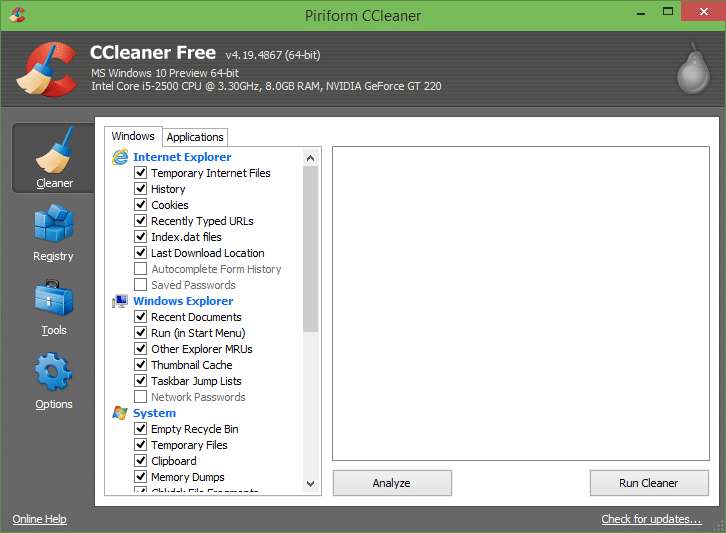 CCleaner 5.0 and above versions are fully compatible with the latest Windows 10 operating system. PC users who have installed Windows 10 on their computers can now download the latest version by visiting the official page of CCleaner provided at end of this article. As you likely know, CCleaner helps you clean temporary and log files not only generated by the Windows operating system but also junk files generated by third-party applications. CCleaner officially supports Firefox, Opera, Safari, Chrome, WinRAR, Adobe Reader, Microsoft Office and tens of other third-party applications. One can increase the support for third-party applications by installing a free utility called CCEnhancer. It adds support over 1000 new third-party applications. One of the very useful but ignored feature of CCleaner is its ability to delete individual system restore points. If you use System Restore feature of Windows, you probably aware of the fact that Windows doesn’t let you delete individual restore points. That is, you need to turn off System Restore feature in order to delete all restore points. If you have multiple restore points and want to delete a restore point without deleting other restore points, CCleaner is the ideal tool for the job. CCleaner is packed with a good Registry Cleaner as well, which means you don’t need to look for another expensive software to clean and defrag Windows Registry. Drive wiper to completely wipe data from your hard drive and file finder to quickly search for files are the two other useful features present in the current version of CCleaner. All in all, a fantastic utility for the Windows operating system. Now that the latest version of CCleaner is compatible with Windows 10, CCleaner now officially supports Windows versions from Windows 2000 to Windows 10. 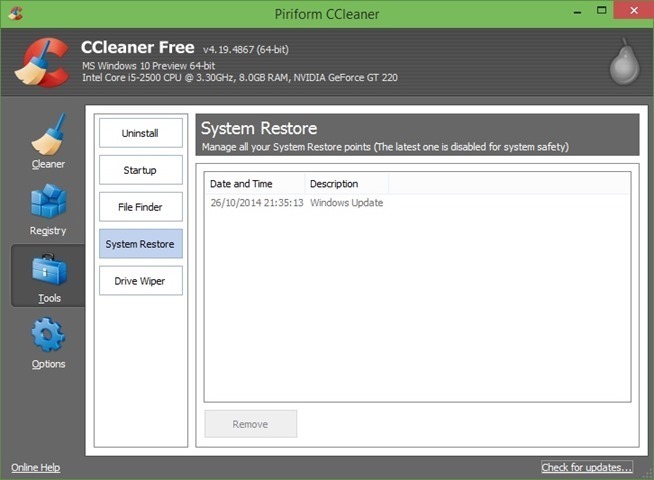 Clean Master is another good tool to clean up the Windows operating system. Visit the following page to download the latest and greatest version of CCleaner for Windows 10. I use C Cleaner. At the moment nit doesn’t work. E mailed them twice. No response. Really depressing. now my once great gateway laptop is in need of dire repair because of ccleaner. there is a antivirus program that comes with cc cleaner that makes windows media player stop working. and you have to reinstall windows to get it to work. Does not work. Received error message when trying to remove groove music. Removing old or unrequired system restore tip is awesome. I’m also using ccleaner since months however never dug this feature. Thanks for pointing out, will implement this today!